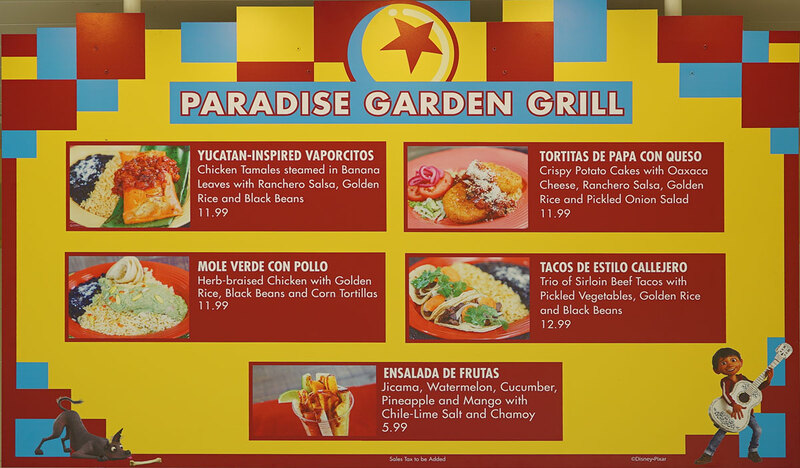 Paradise Gardens Park is a land in the midst of an identity crisis. 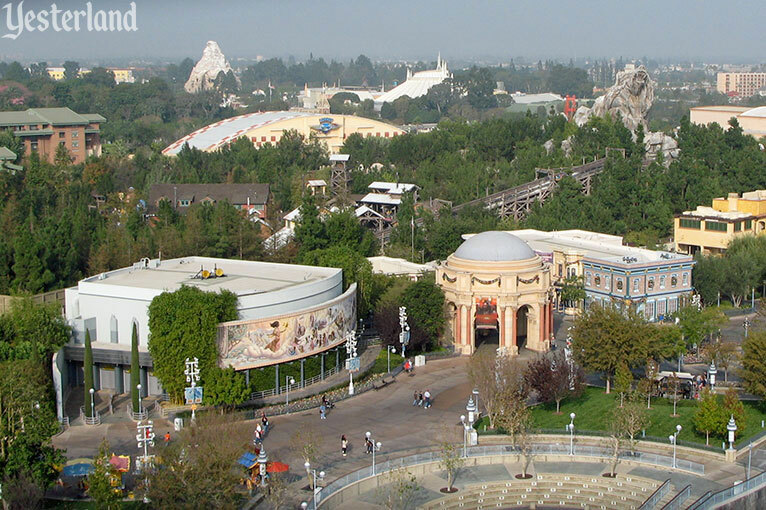 It used to be a part of Paradise Pier. 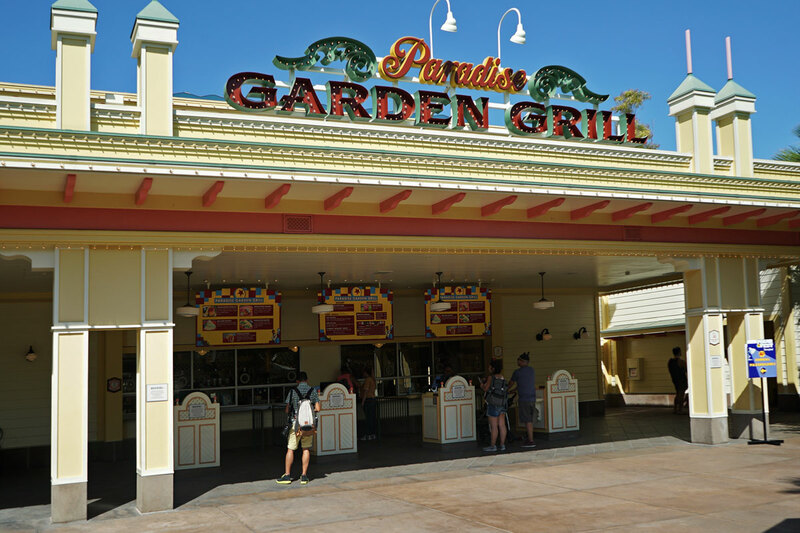 But when the land was refurbished and became Pixar Pier, the leftover parts that didn't fit that theme became known as Paradise Gardens. So just what exactly is the theme of this land? I'm really not sure. 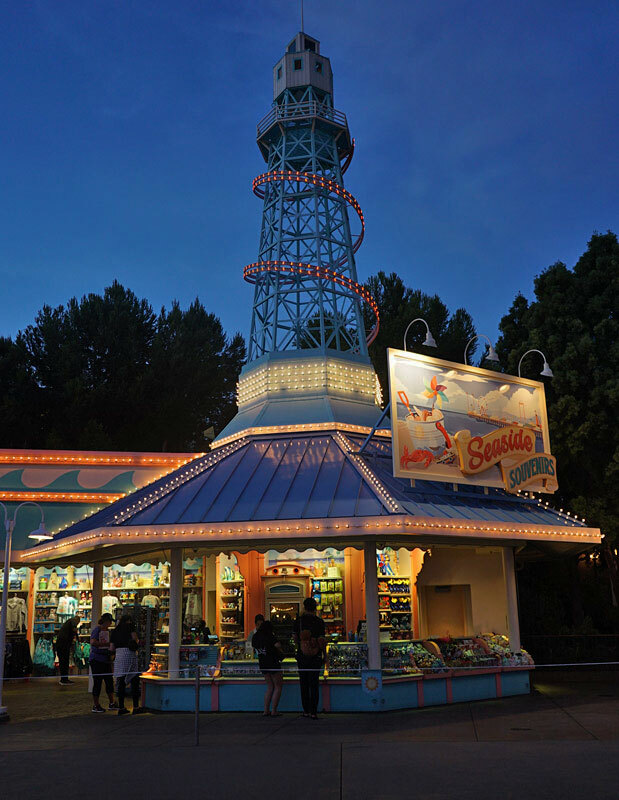 It's got two attractions based on the Little Mermaid, a Goofy-themed roller coaster, a vintage swing ride, and a large food court featuring Italian and Mexican food. 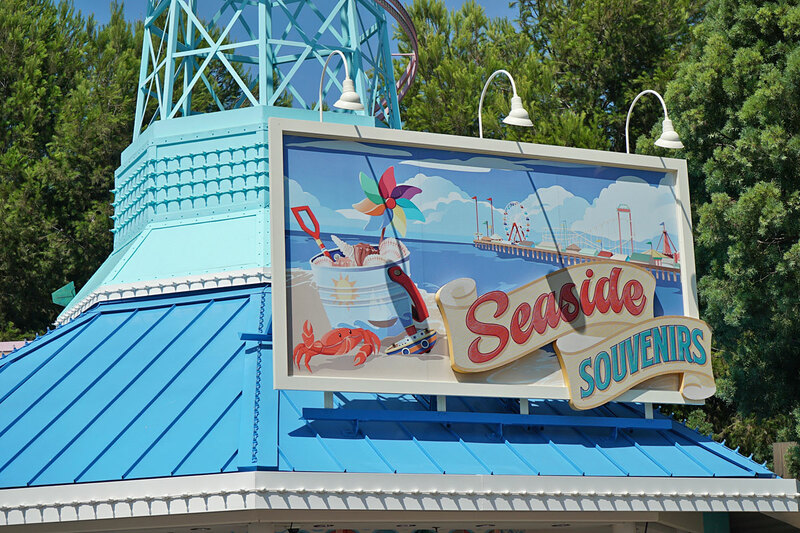 It still has that "seaside attraction" theme running through it, and there's hardly any barrier between it and Pixar Pier. So the area still feels like one big land. 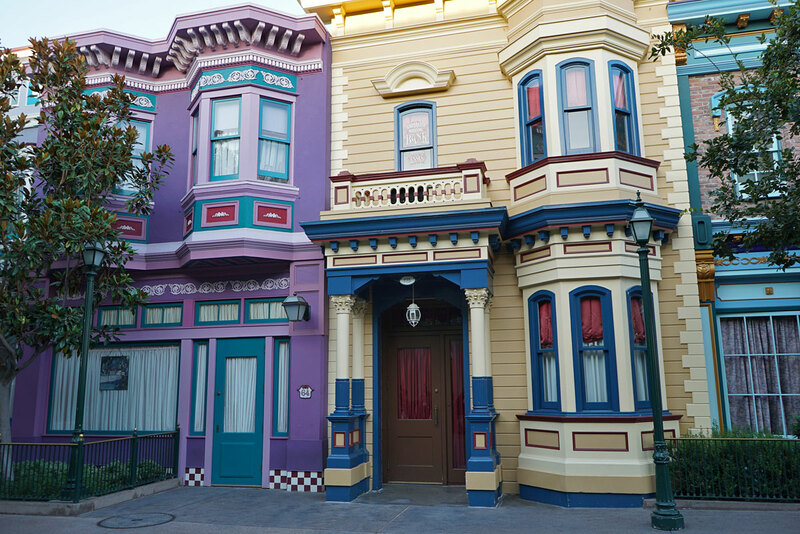 But this is a leftover problem from when the park first opened. It featured so many mini lands, and they all seemed to blend into one another. You never knew when you were leaving one land and entering another. 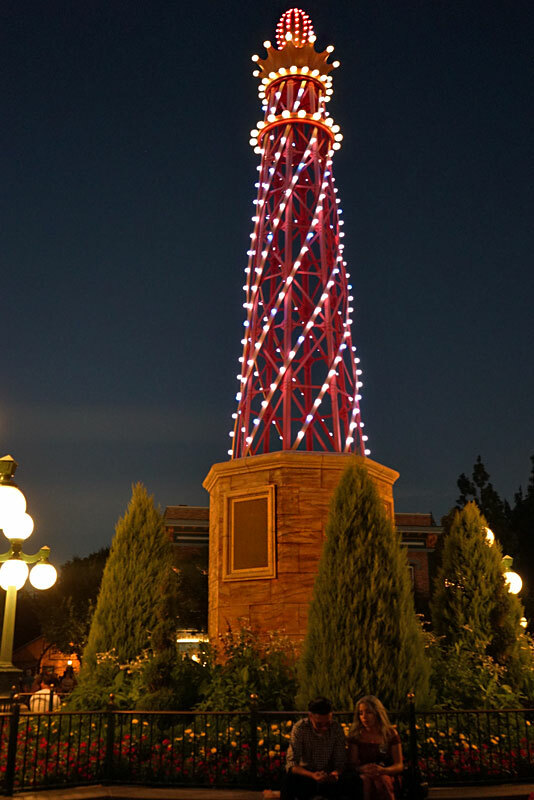 The Paradise Park lighthouse lit up at night. 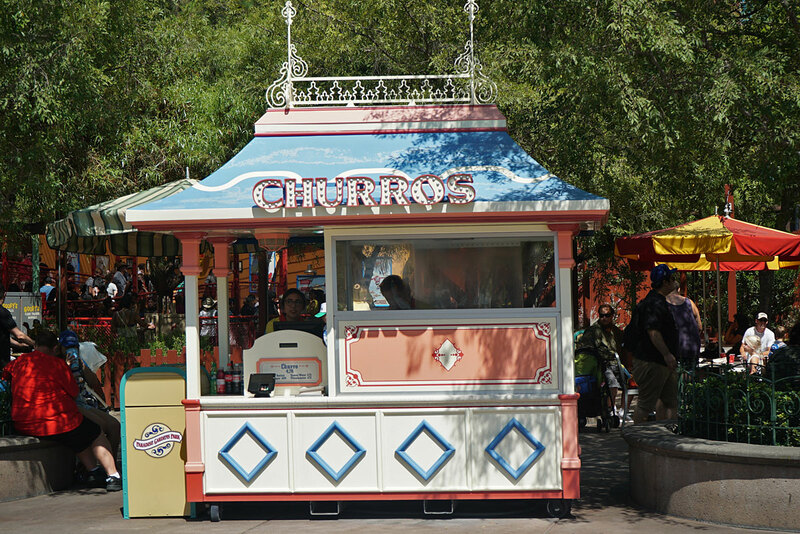 The Churro stand definitely has that old-fashioned seaside look. 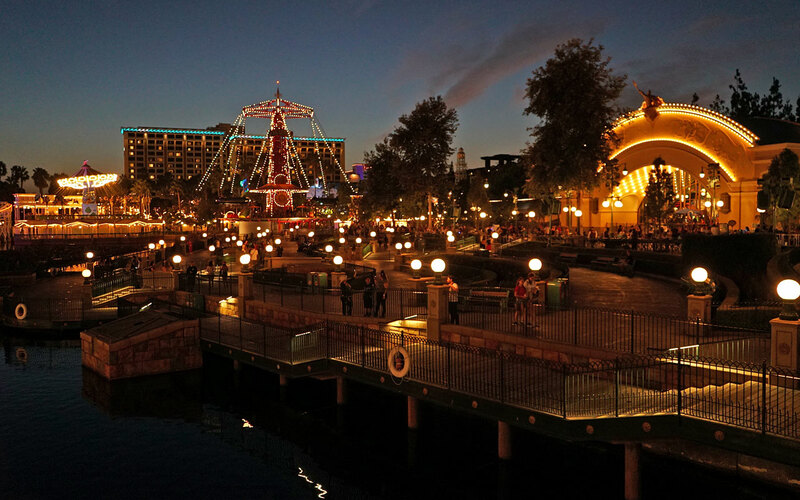 Whatever the theme, it's still looks pretty all lit up at night. 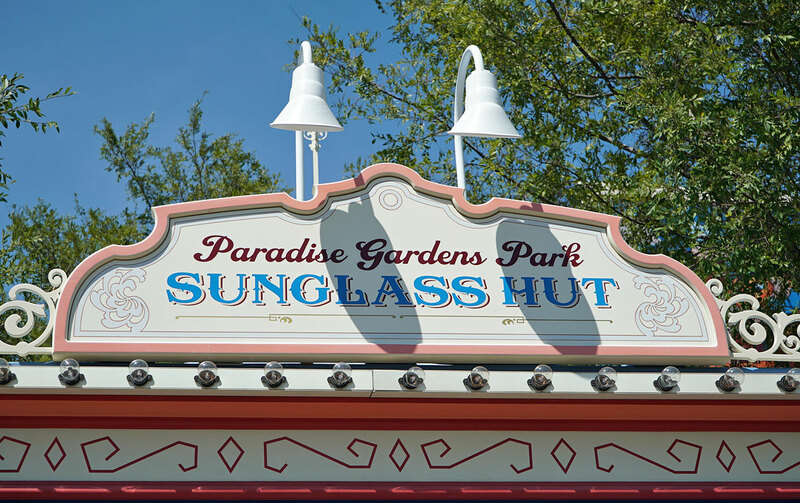 The Sunglass Hut has also gone through its own identity change. 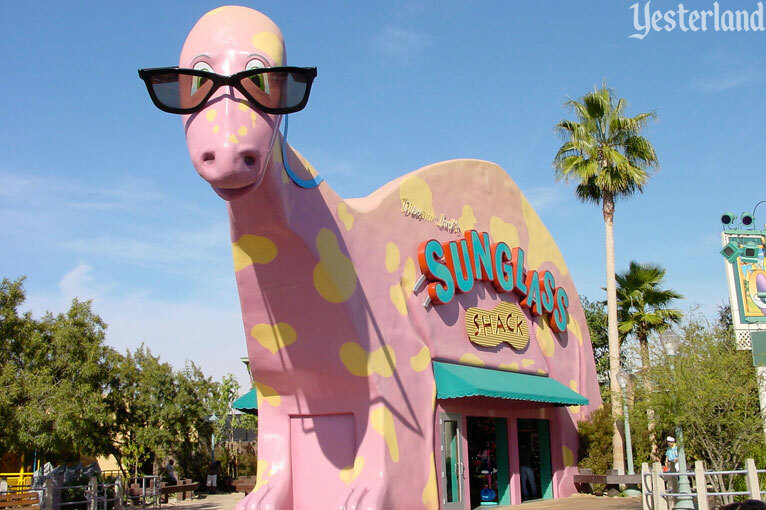 Back when this area was known as the "Route 66" section, the Sunglass Shack was the shape of a big brontosaurus, as a homage to the roadside, tourist trap type attractions you'll find along Route 66. 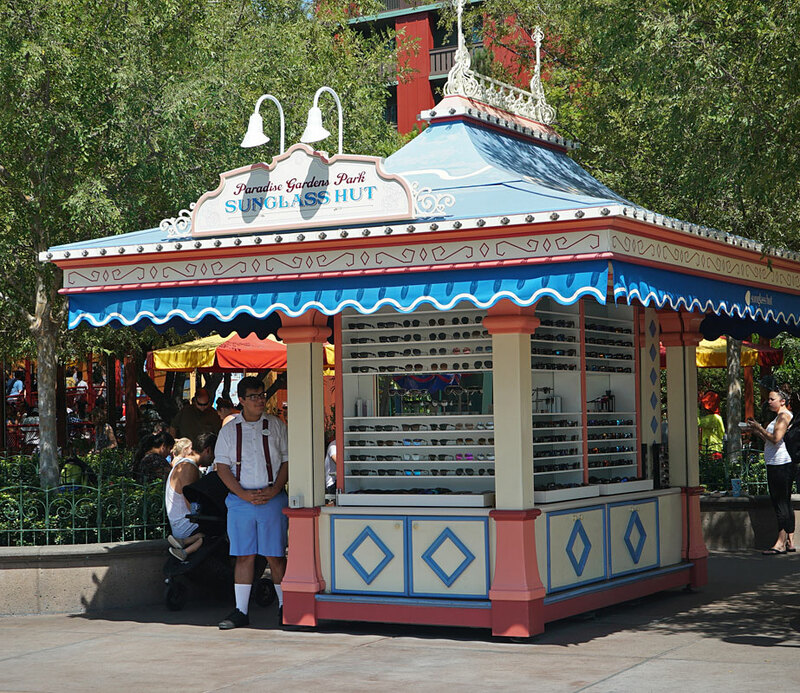 As you can see, it's been scaled down quite a bit, to a small kiosk to fit the Paradise Pier/Gardens seaside theme. 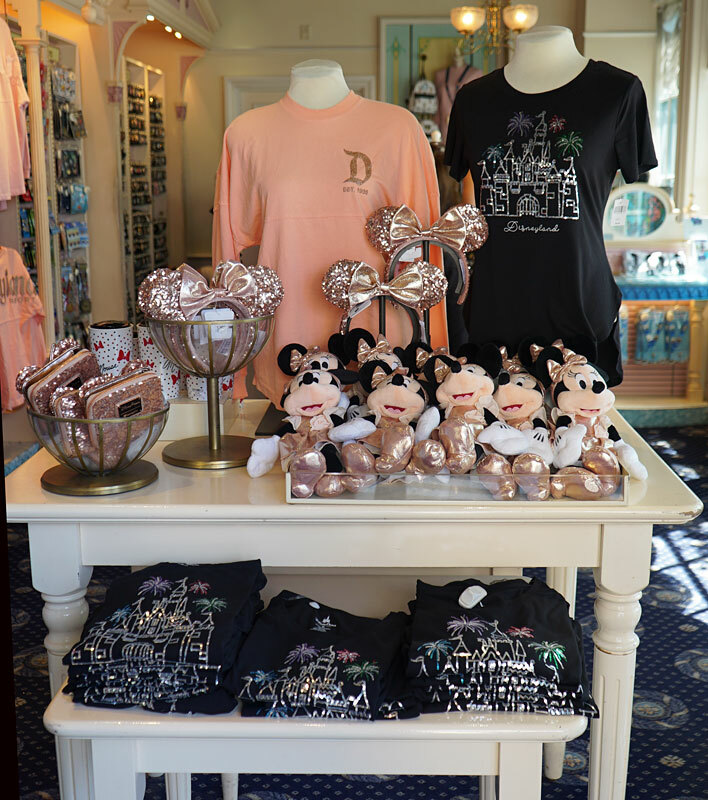 The old shop had a larger selection of merchandise. 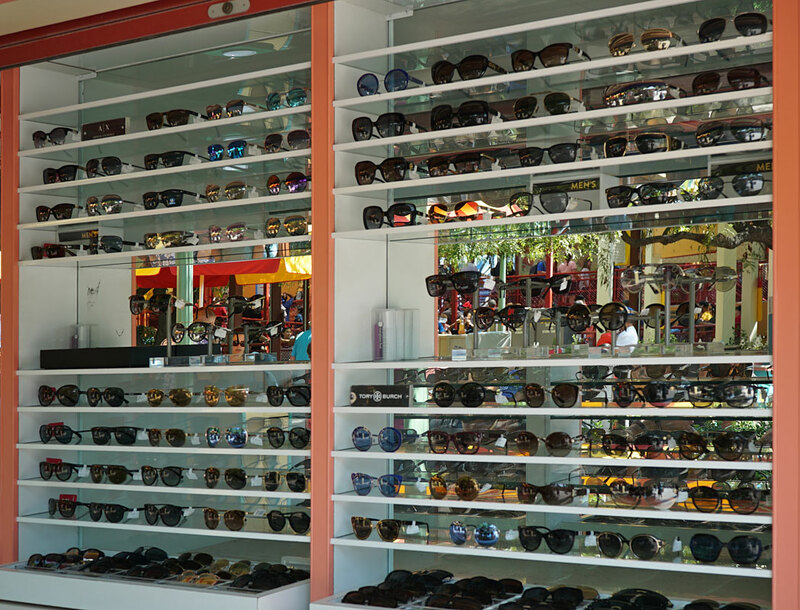 This one just sells sunglasses...expensive sunglasses. 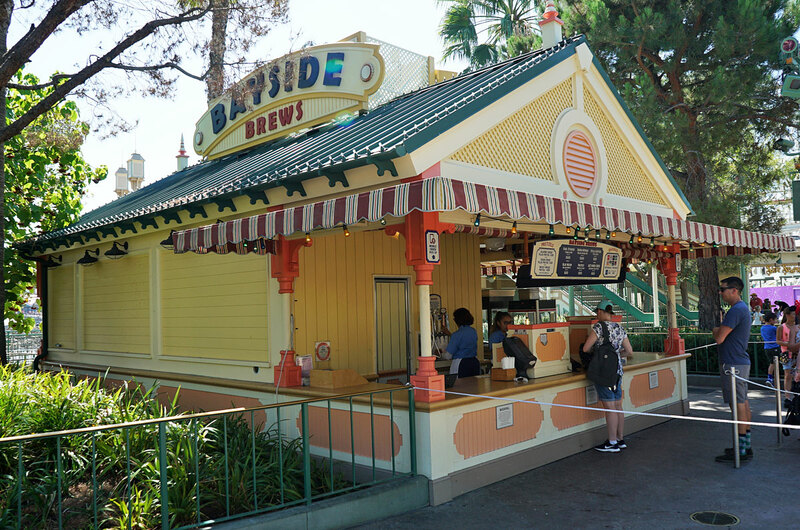 Bayside Brews sells pretzels, assorted beverages, and yes, heaven forbid/Walt is rolling over in his grave...BEER. Yes, DCA sells alcoholic beverages! 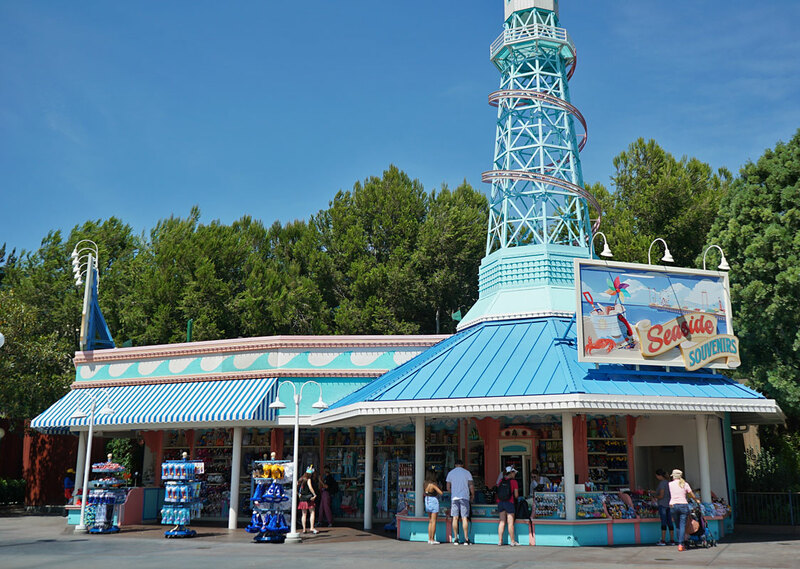 Actually, I don't know if any of the other Disney parks sell alcohol, but Disneyland has never sold it. And from what I've heard...may actually start to in the near future. Oh, the horror. 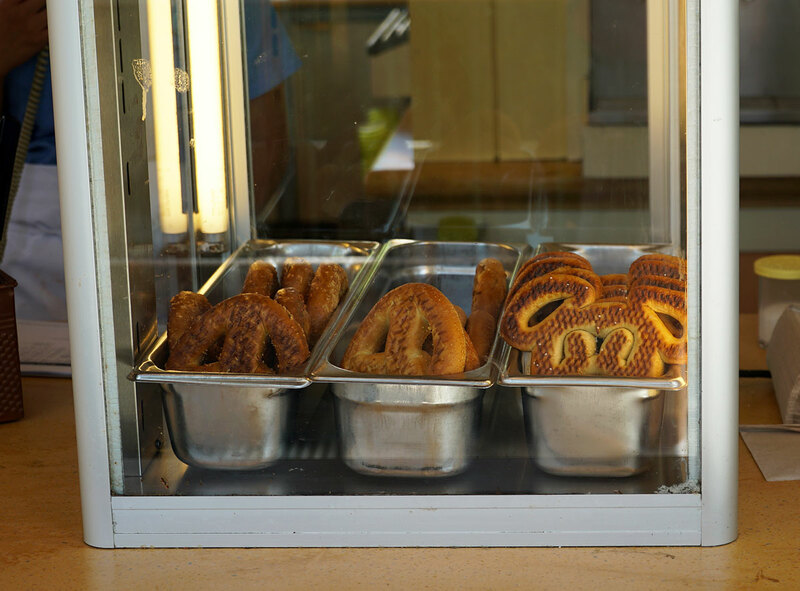 Gotta have pretzels with beer. Expensive.. expensive.. BEER! 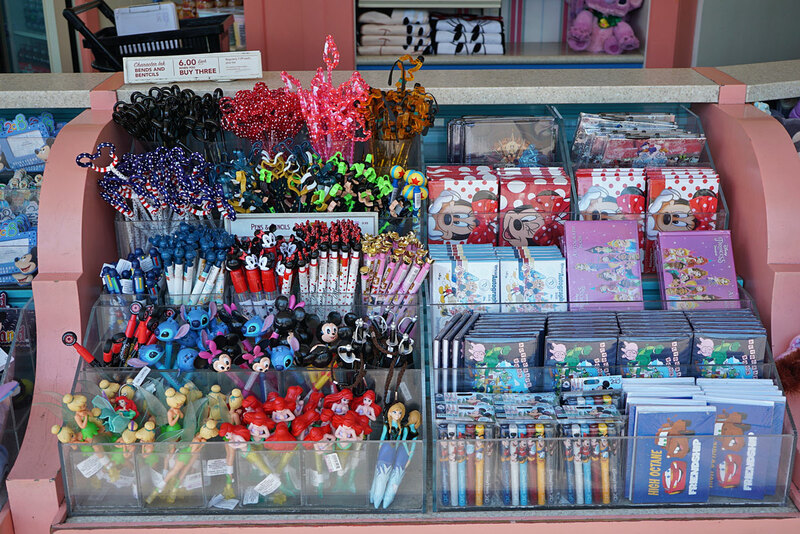 Last I was there I got a few at the wharf area that's adjacent Pixar Pier. Yum. I believe they have a limit of 1.5oz of liquor per mix drink, so if you're gonna blow your money on alcohol, do it on a beer! 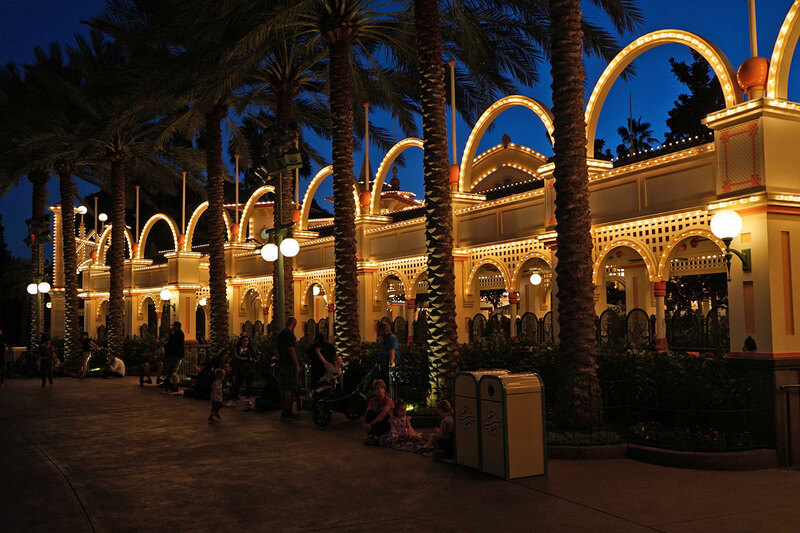 All the World properties besides Magic Kingdom sell alcohol. 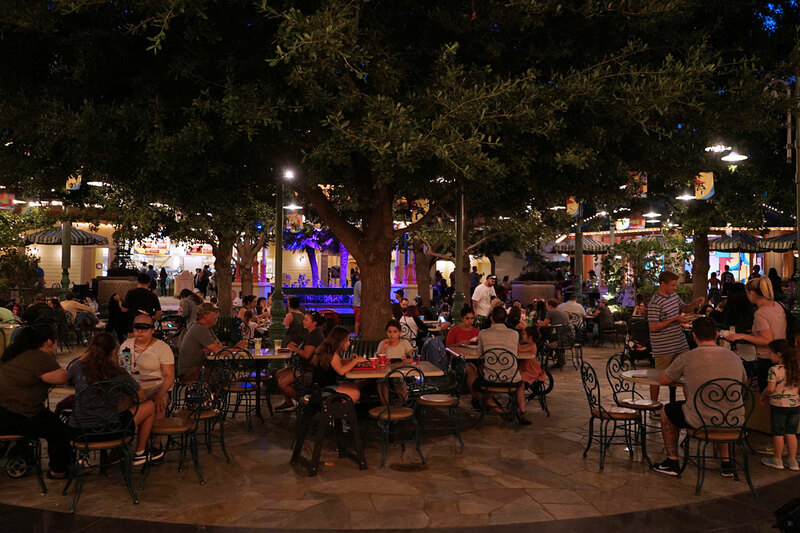 I think only Epcot has relaxed standards on how much alcohol can be served, hence the drinking around the world craze. 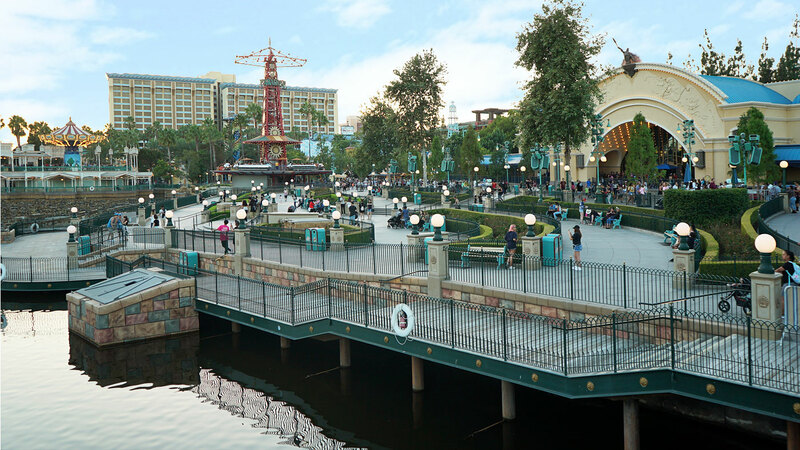 The walkway around the lagoon has some interesting little stops, but the areas cohesion is still somehow lacking, as are the number of attractions. It's certainly improved from what it was opening day.. 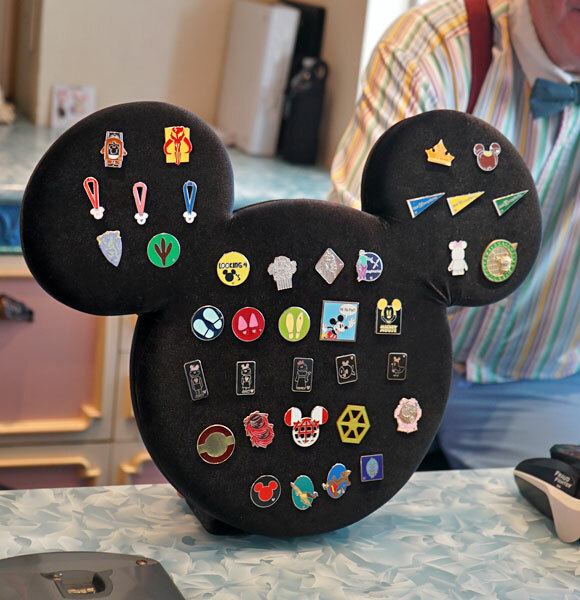 I think another e-ticket or even just d-ticket attraction somewhere around the bend from Pixar Pier up to Little Mermaid would help things out. It's mostly just spillover amenities. 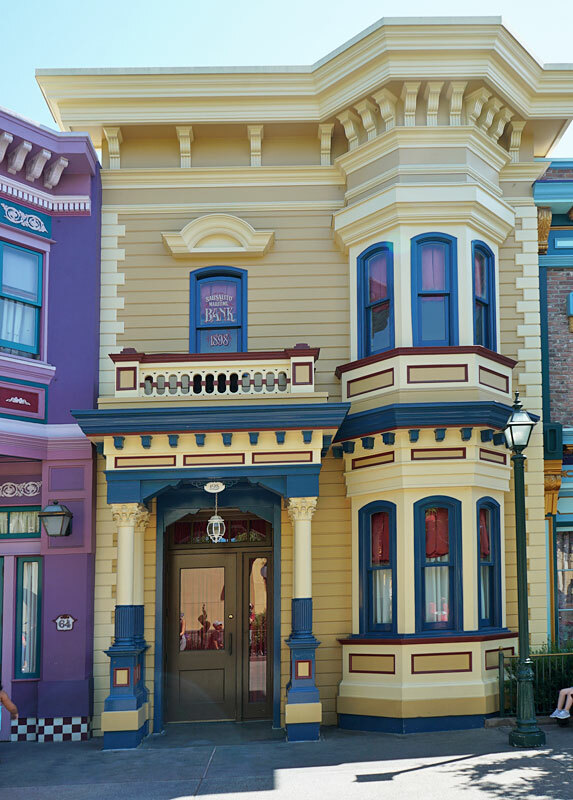 Across from the Little Mermaid attraction is a row of San Franciscan-style Victorian houses...which adds even more confusion to the theme of this land. 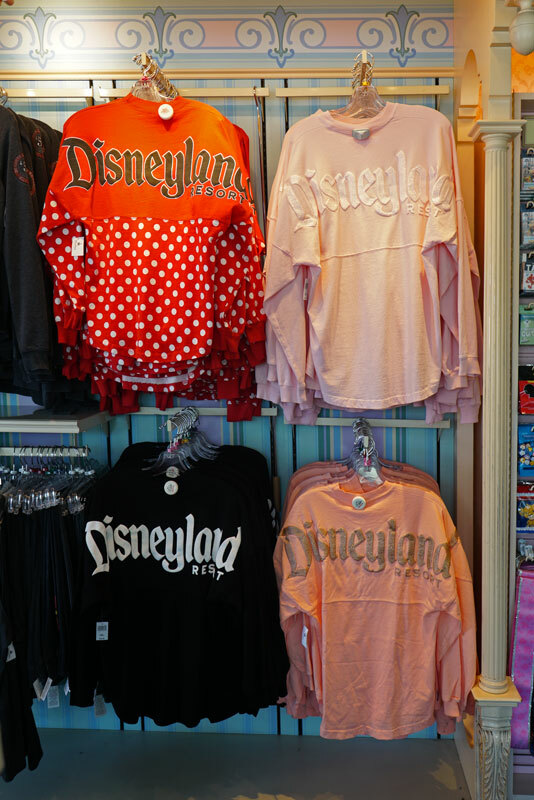 But once again, these are leftover from the early days when this was the Bay Area District of the Golden State land. Back then, the Golden Dreams show with Whoopie Goldberg played where the Little Mermaid now resides. 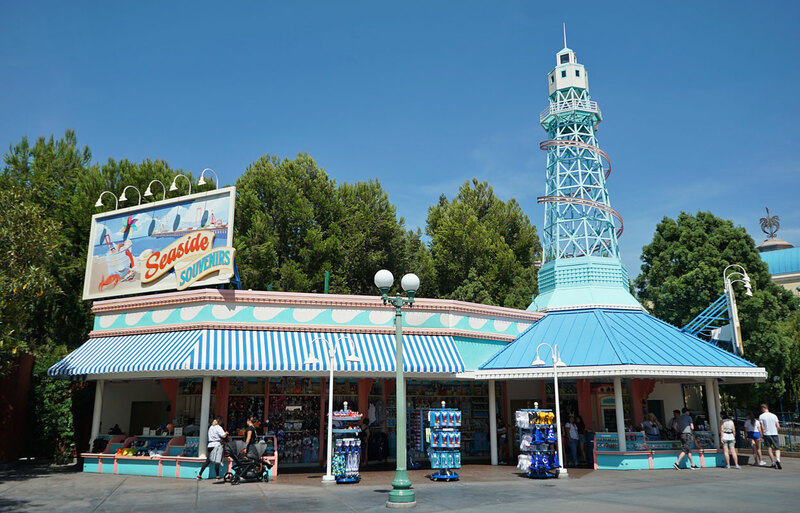 The round building is based on the Palace of the Fine Arts in San Francisco, and remains here today, serving as the entrance to the Little Mermaid attraction. 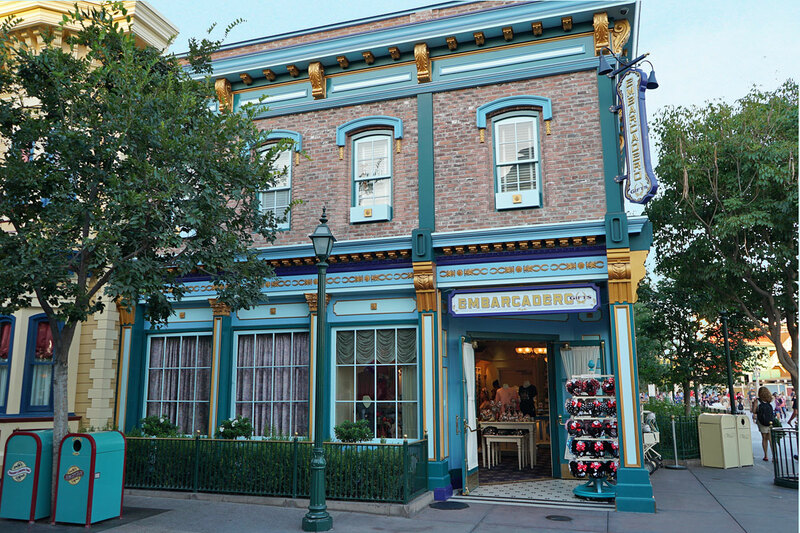 Anyway, back to our row of Victorian buildings. 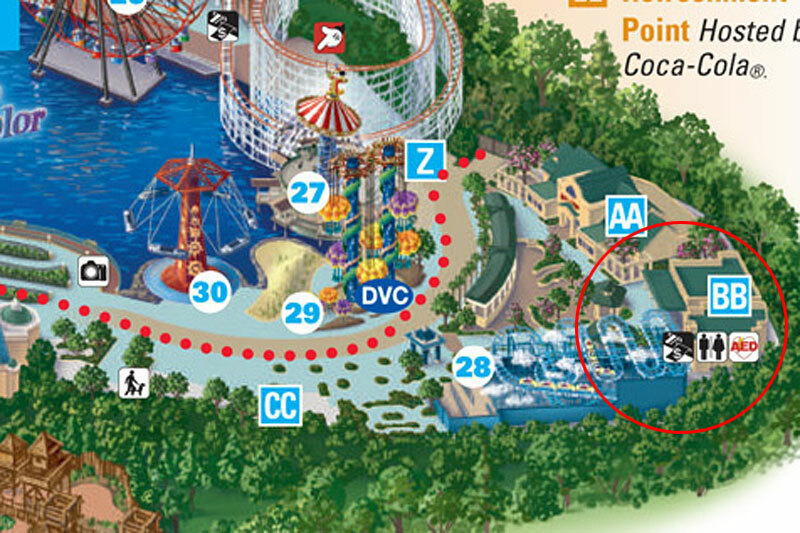 On the far left is the restrooms. The center building is the Sausalito Maritime Bank, although it's strictly a facade. 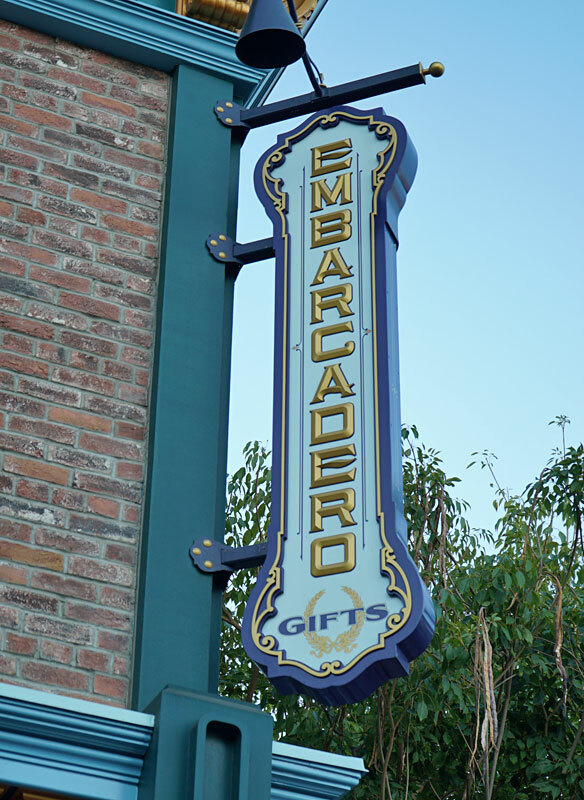 And on the far right is Embarcadero Gifts. 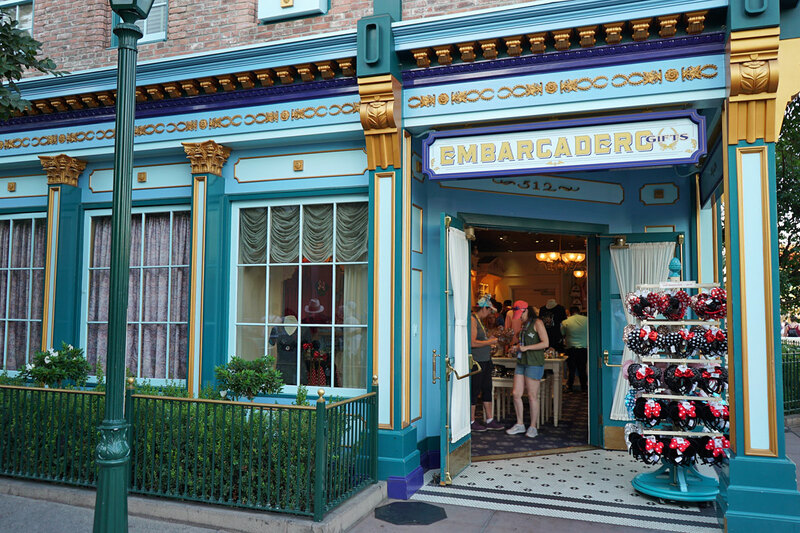 Embarcadero Gifts is a small shop mainly featuring women's apparel and Disney trading pins. 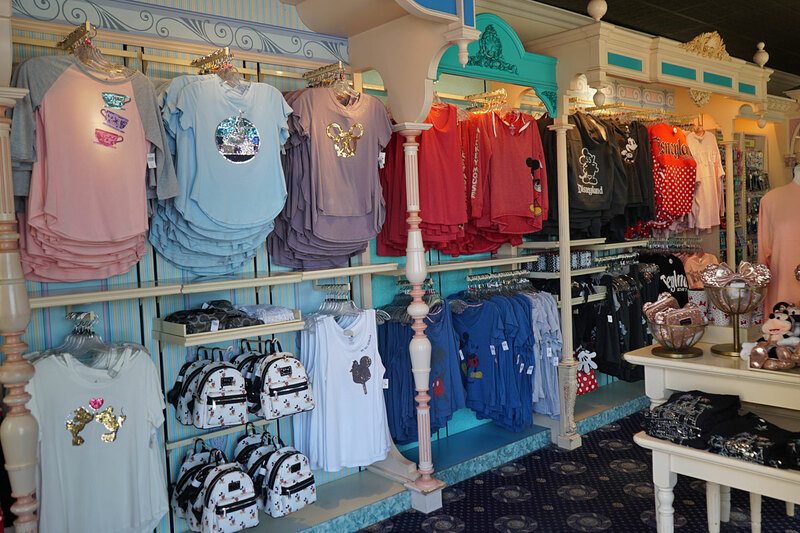 At one time, Little Mermaid merchandise was the main staple here, but that has since been replaced with general Disneyland Resort gifts and apparel. 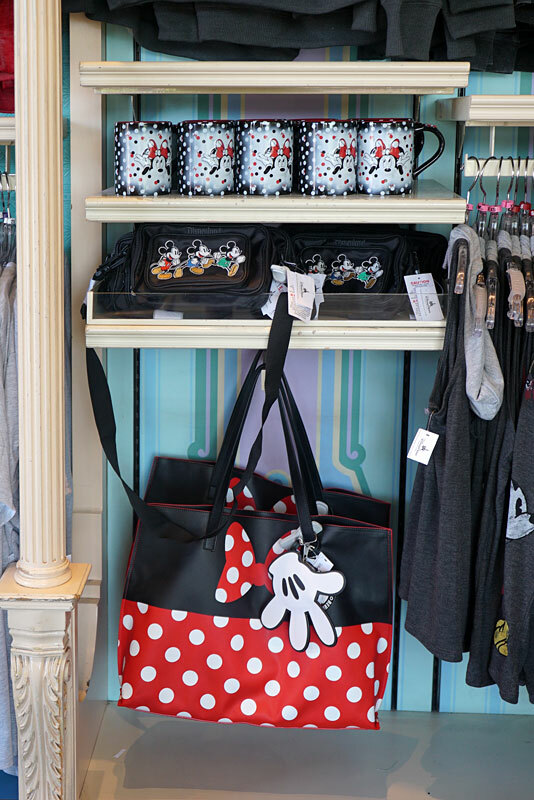 And lots of Minnie Mouse gifts. 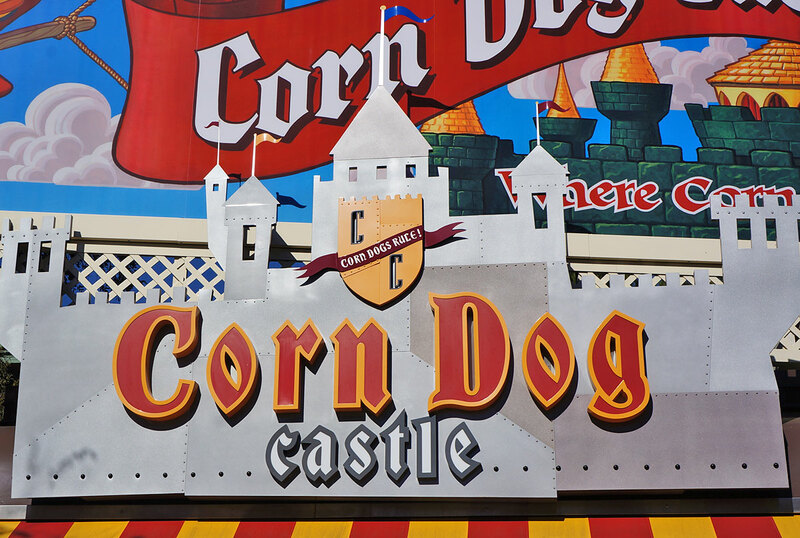 Corn Dog Castle is a medieval-themed boardwalk stand that features...you guessed it. 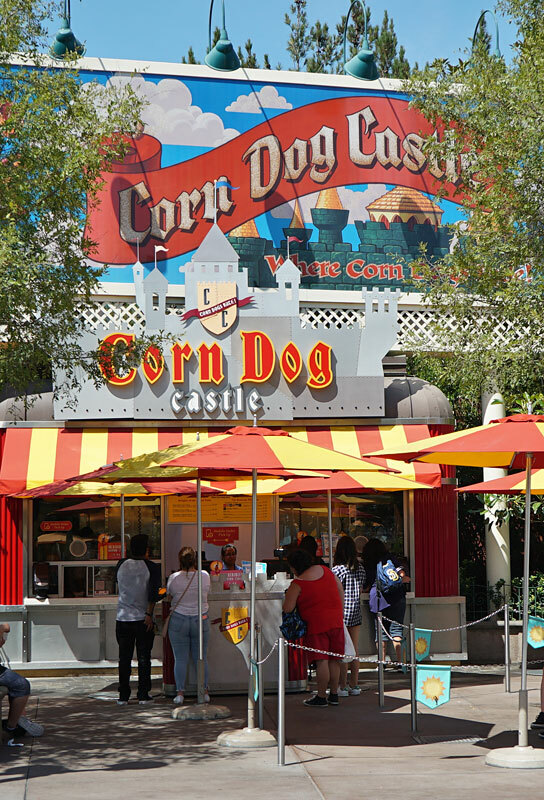 Corn dogs! There's always a line at this small, counter-service eatery. 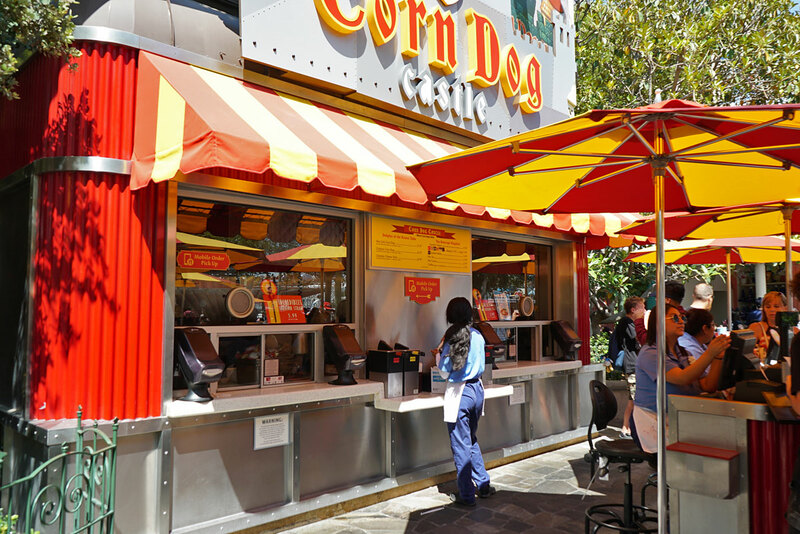 Its simple menu offers the Original Corn Dog, Hot-Link Corn Dog, and Cheddar Cheese Stick. 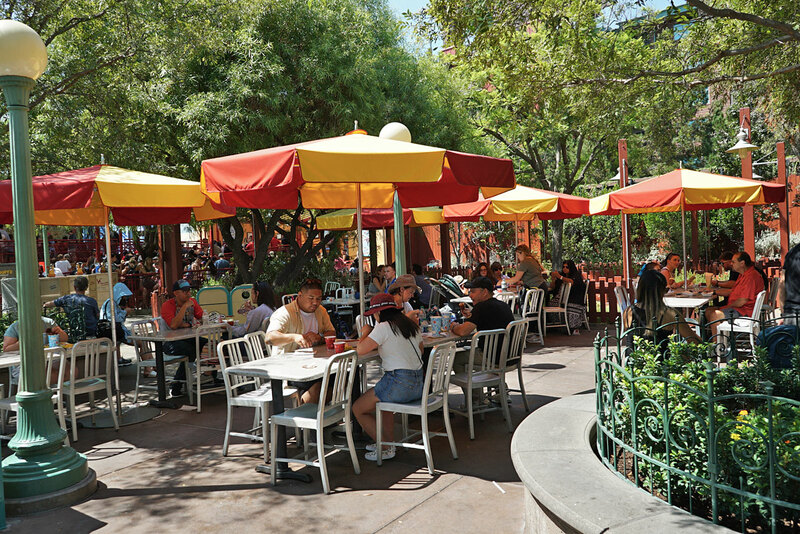 To the left of the stand is a small dining area shaded by red and yellow colored umbrellas. This photo was taken a few years back before the trees began to obscure the colorful billboard above the stand. 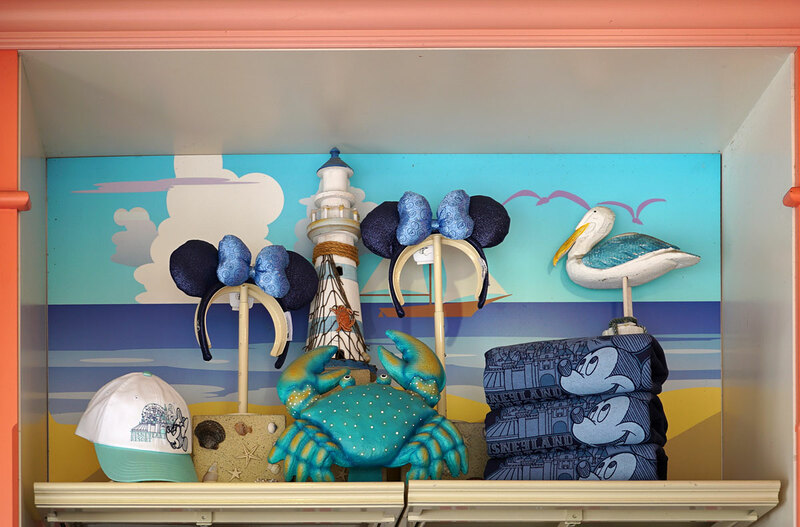 This open-air shop offers a large selection of Disney merchandise and specialty hats. 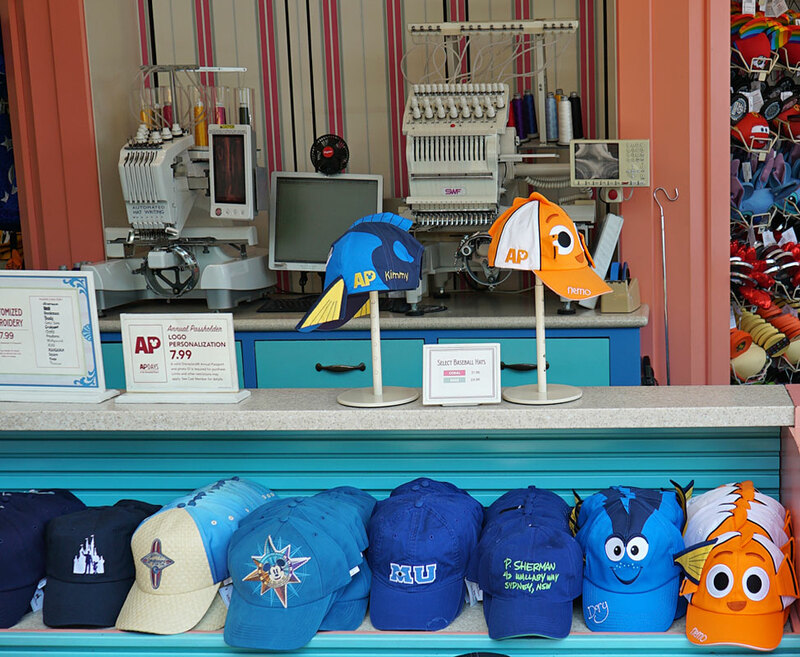 You can get custom embroidery here, like many of the shops that sell caps at the Disney parks. 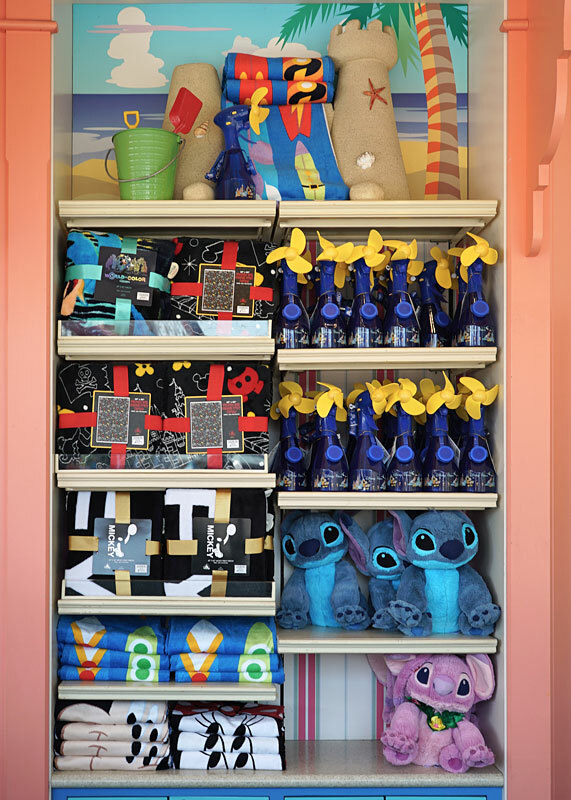 Disney beach towels are sold here to match the beachy theme of the shop. 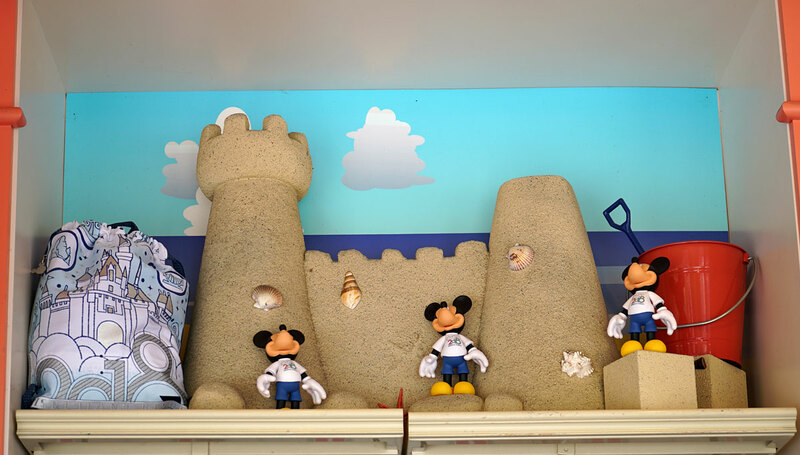 Cute seaside scenes are displayed above the merchandise. 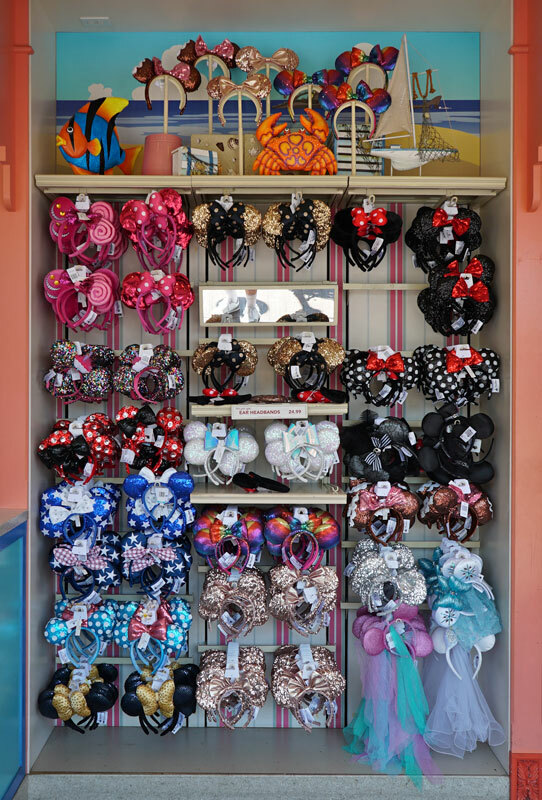 Minnie Ears in all sorts of colors and styles. 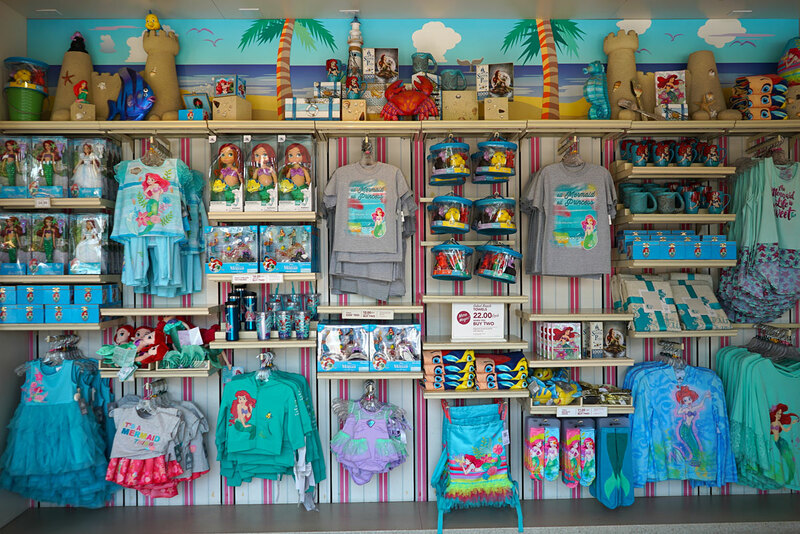 That's a whole lotta Little Mermaid merchandise. 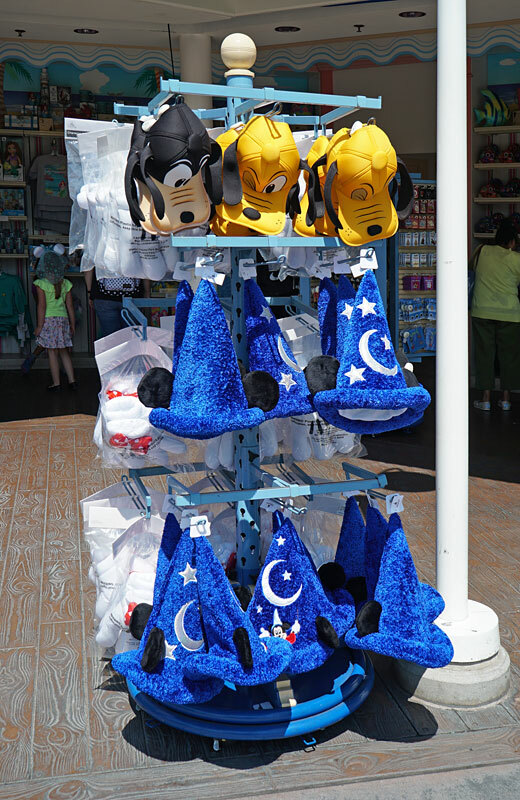 You'll find a big selection of Disney character hats here. 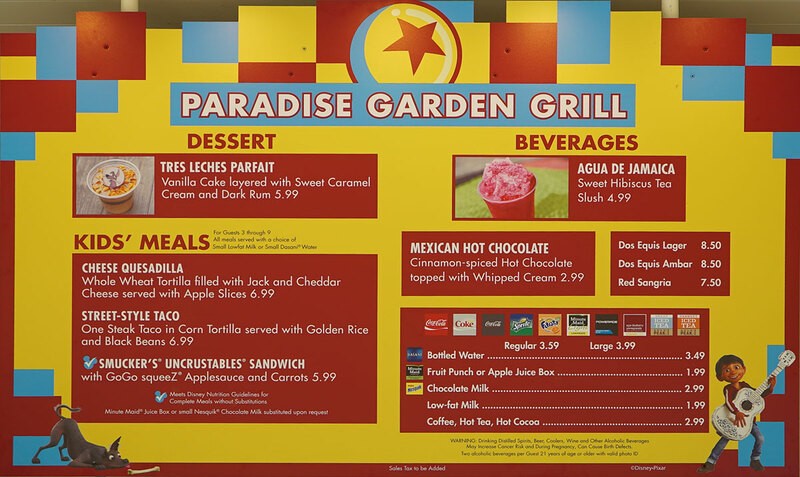 The Paradise Garden Grill is a counter service restaurant, featuring a menu that changes frequently, showcasing cuisine from different countries. 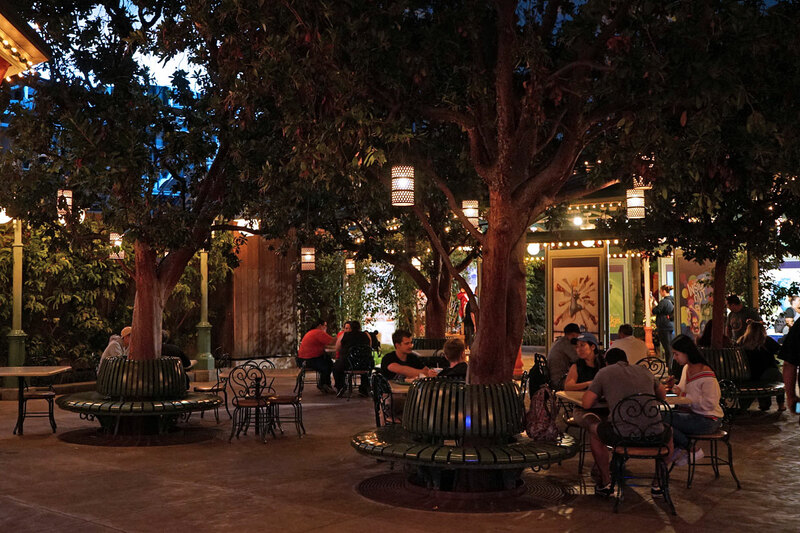 At the time of this shot, Disney's hit movie "Coco" was the theme, and the menu featured authentic Mexican cuisine. 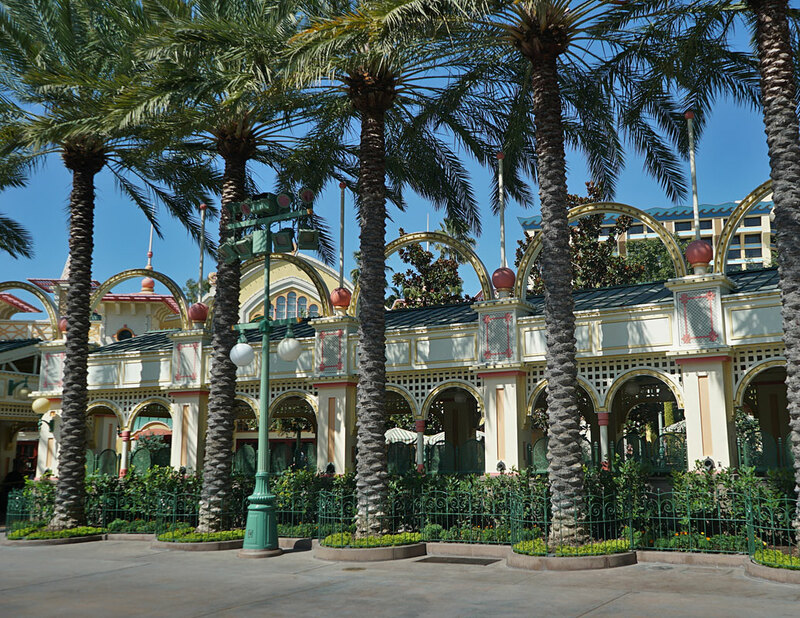 A palm tree lined courtyard provides guests with large covered dining pavilions. 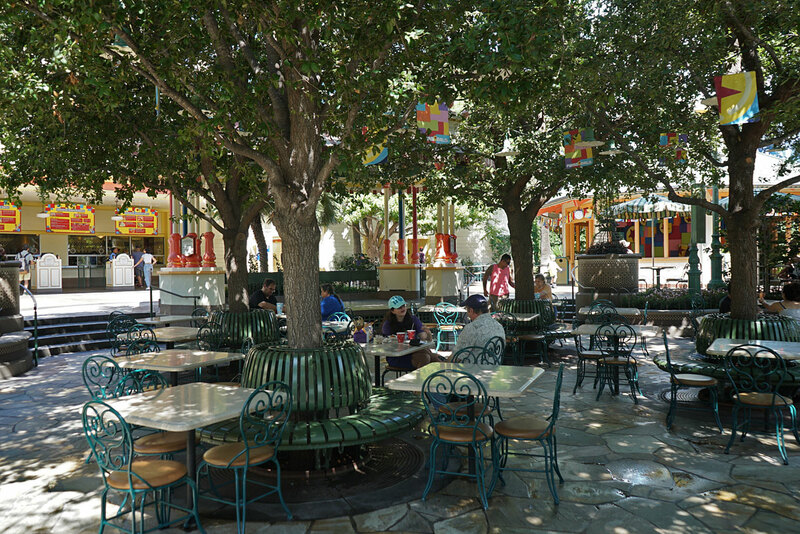 A tree-shaded courtyard offers a more secluded place to dine... away from the hustle and bustle of the Paradise Gardens Park and Pixar Pier areas. This is one of my favorite places to dine, especially when I need a break from the crowds. A small bandstand provides entertainment several times a day. 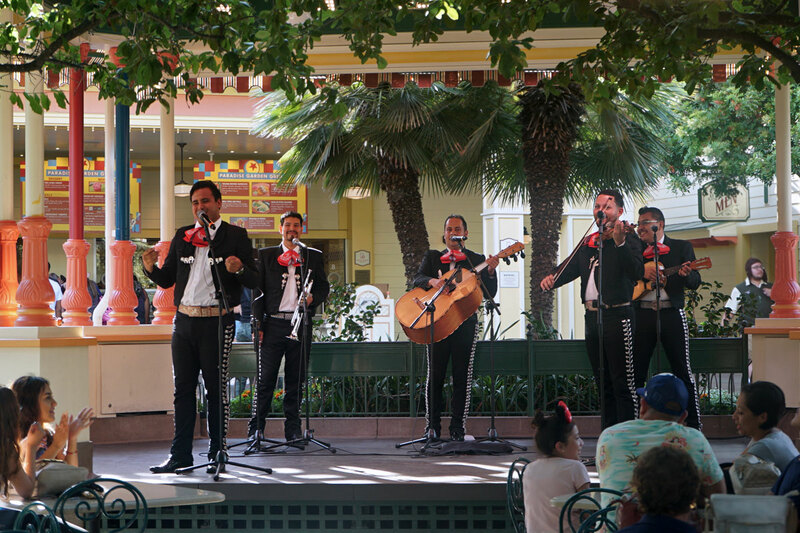 Keeping with the Mexican theme, the entertainers playing today are the Mariachi Espactacular. The menu at the time of this shot. The upcoming menu will feature Asian cuisine to celebrate the Chinese Lunar New Year. The Aqua De Jamaica is a favorite thirst quencher of mine. Here's a few night time shots. I'm a bit confused by this one. Must have been changed/updated since I was last there. I can't figure out where exactly this is? Help please. 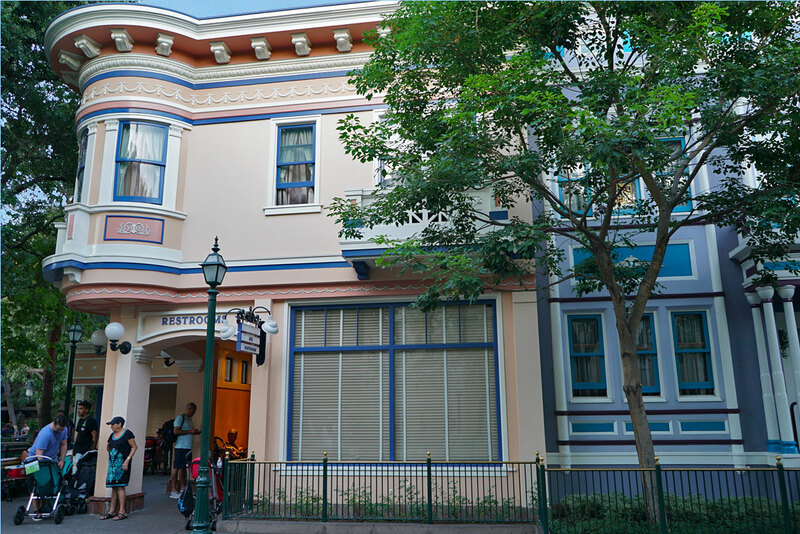 It's right below Goofy's Sky School, roughly where the original Pizza Oom Mow Mow restaurant used to be before the first refurb of the land. Amazing photo report. 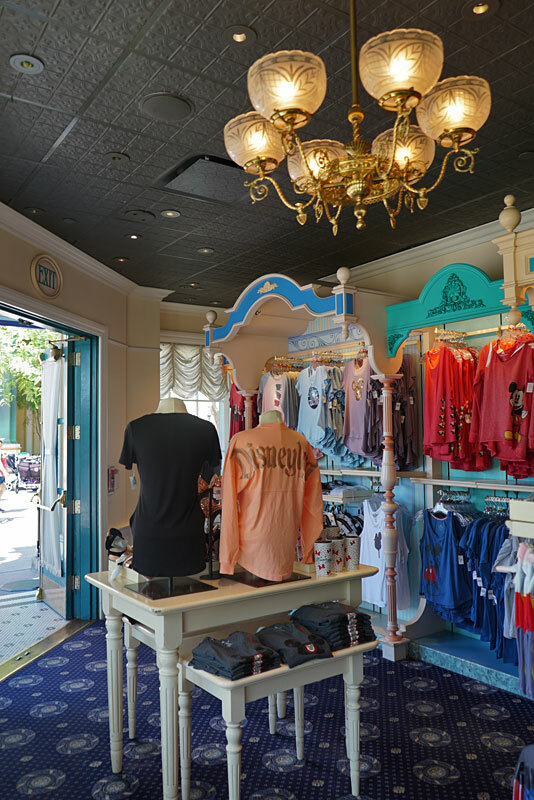 I do like that you showcase each area (gift shop, restaurant, etc) in full detail even with menus! Well done! wow - I guess I haven't wandered into that back corner. Didn't realize there was so much shade back there. Looks like a trip out west is needed to catch up. Again, I'm impressed by the signage. 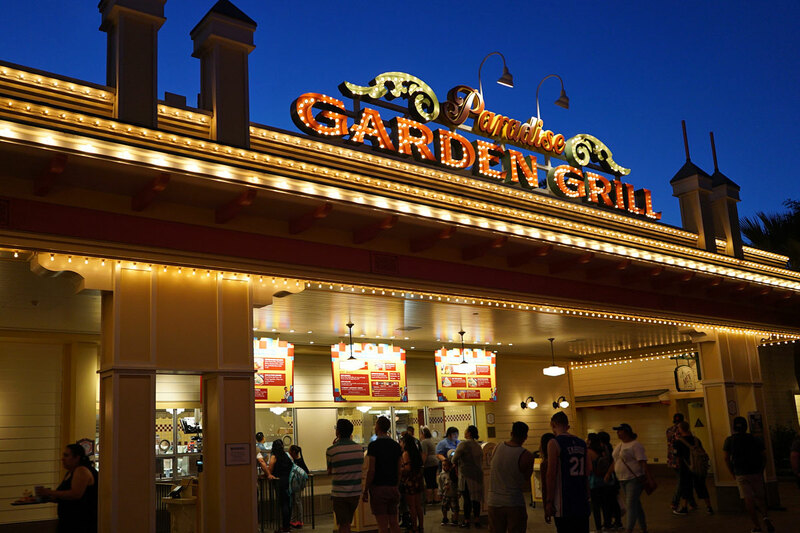 The Paradise Garden Grill sign looks great, both by day and night. What are those warning signs on the white & gold pedestal thingys in front of the ordering windows? This looks like a very beautiful, peaceful, and casual place to sit and eat; my kind of place. I like that the menu changes periodically to showcase different cuisines. I knew you'd be the one to notice those. State law requires warning signs to be posted at any place that contains toxic building materials, no matter how minute the chances of anyone being exposed. 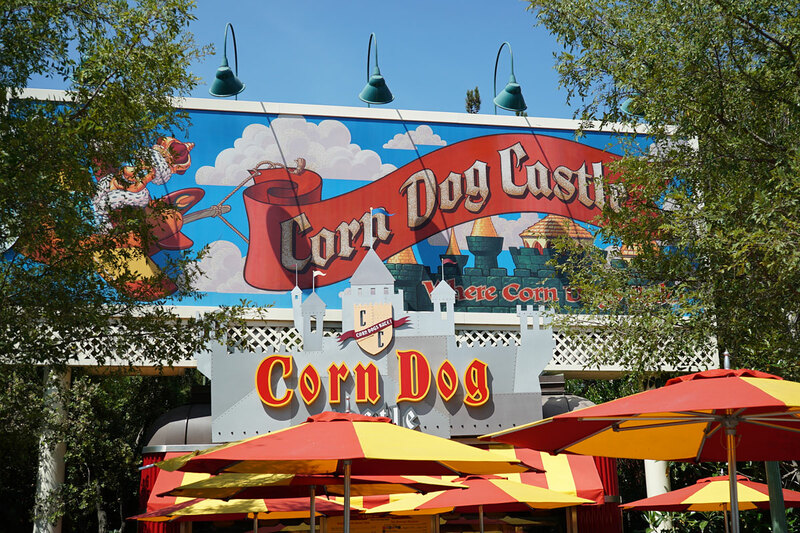 For some reason, they are extra, super, over-the-top, fanatical about placing these signs throughout Disneyland. They all typically read the same...“The Disneyland Resort contains chemicals known to the state of California to cause cancer and birth defects or other reproductive harm.” There are also signs warning of certain ingredients in the food or drinks served at the establishments that may also be unhealthy. I expect that's what these warning signs are. Blame it on Proposition 65, the California Safe Drinking Water and Toxic Enforcement Act of 1986. I noticed that on the menu board as well. Beer causes cancer? How am I still alive? All these pictures here are a treasure of information, inspiration and entertainment. Thank you so much for showing them here! Very interesting read and nice photos, shyguy. 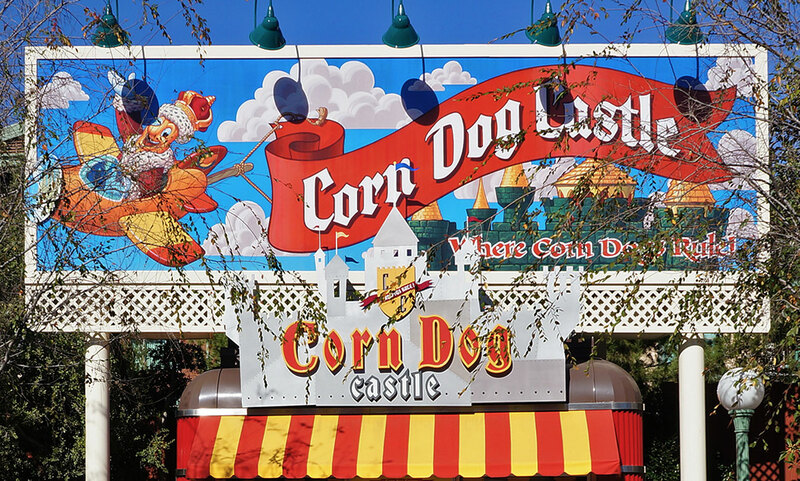 Have to say I just went to the Magic Kingdom last week and I was very disappointed by the food. 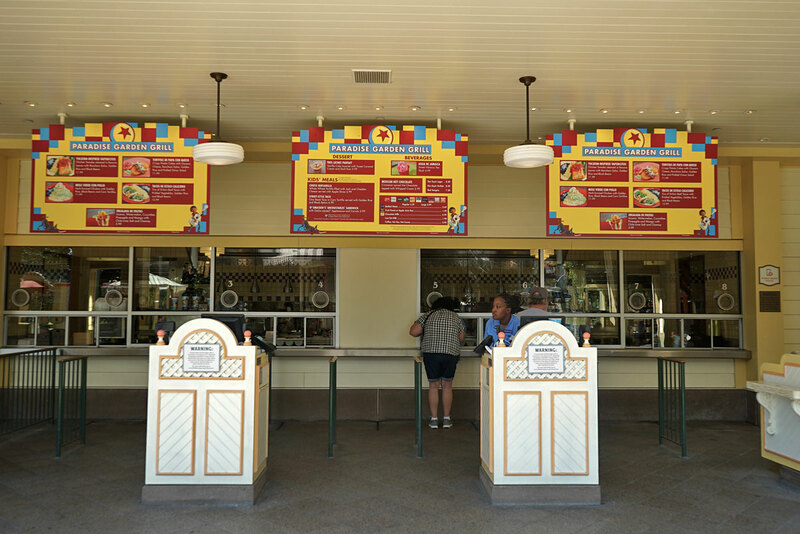 All the carry out services that we checked into in all four parks had nothing but hamburgers, bacon cheeseburgers, fries, and chicken tenders. Even some, like Gaston's that advertised ham and turkey sandwiches, had the exact same fair as the others. Carts sold popcorn, churros, and pretzels. That's it. Note I am not talking about the sit down restaurants, which had some very good dishes (with a corresponding price tag), but every single take out place had all the same crap. I seriously would rate it below McDonalds. Very off-putting. That's disappointing to hear. 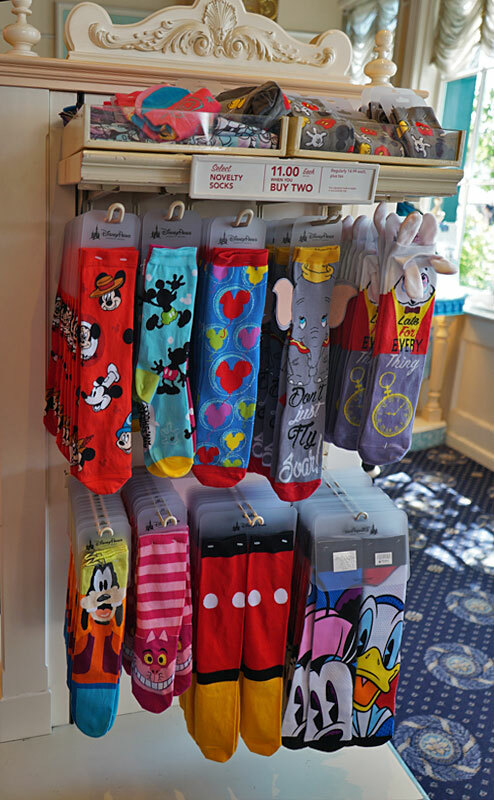 Years ago, Disneyland offered very much the same. But I have seen the quality of the food improve quite drastically over the years...Much more variety and health conscious selections. 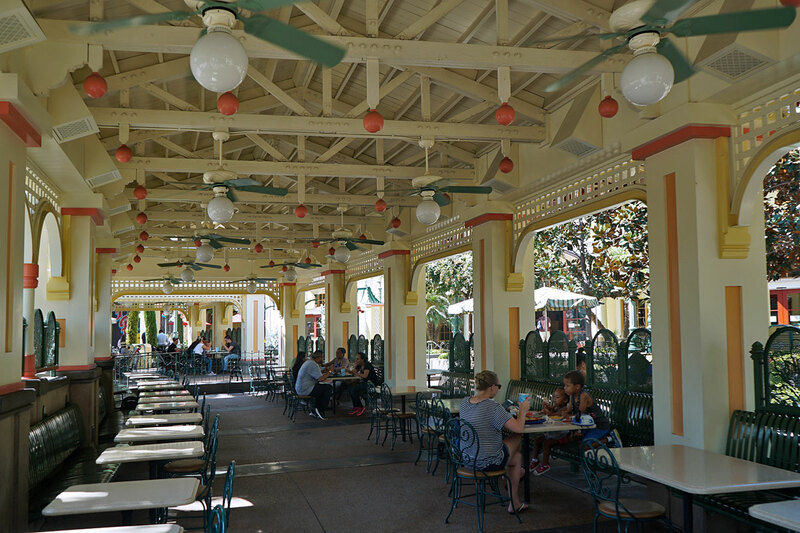 Agreed - I hate eating at the MK, but the other parks do have much better options. There are a few in MK, but you have to know where to find them after experimenting a bit and finding those few gems. I'm becoming a AP today in preparation for all the new stuff (and Star Wars especially). Don't want to rely on my bro to get me in as much as I may want to.